Temporary diverter on SE 50th and Lincoln. 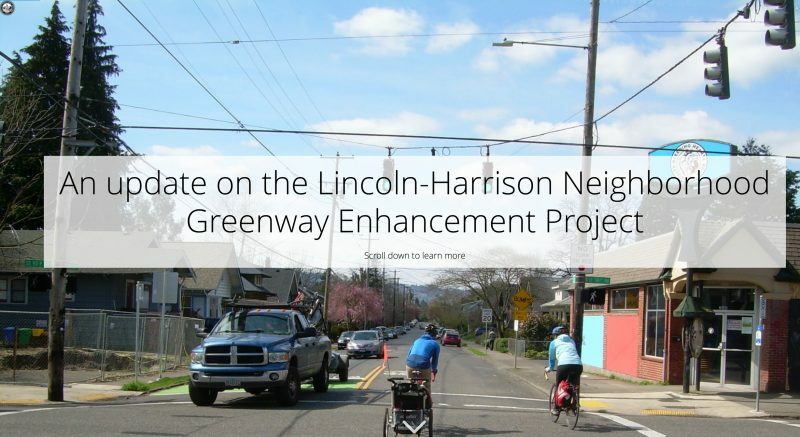 The City of Portland has released a survey to garner your feedback on the infrastructure elements of the Lincoln-Harrison Neighborhood Greenway Project. The project, which launched in October 2017 and was subject of considerable debates among neighborhood residents and road users, is now mostly complete. One of the big-ticket items is the new diverter on SE 50th, which seems to have significantly cut down on the number of people driving on the greenway. New driving discouragers on SE Ankeny at 15th. X marks the spot where people are supportive of changes to SE Lincoln that would make the street safer for all users. The inter-neighborhood hostilities over the city’s Lincoln-Harrison Neighborhood Greenway Enhancement Project seem to have reached a new level. 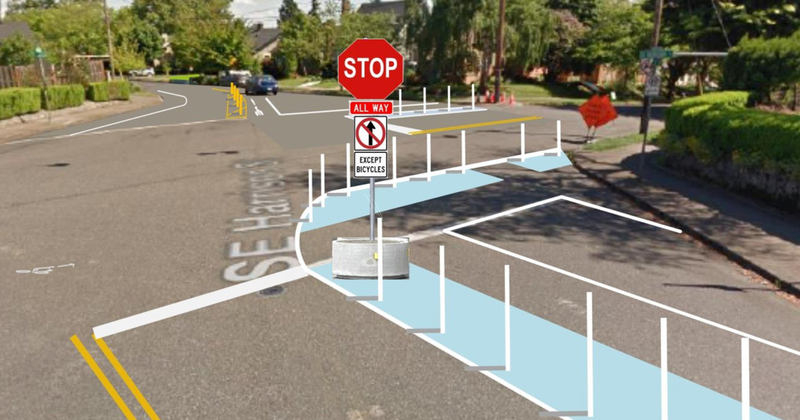 PBOT’s new design for SE Lincoln/Harrison at 30th. The Portland Bureau of Transportation announced changes to a key intersection on the Lincoln-Harrison Neighborhood Greenway yesterday. They also announced a delay for the infamous traffic diverter planned at 50th and Lincoln. Doing something about the problem as the problem streams by. Volunteer activism is alive and well in Portland. Cover of PBOT’s new presentation. 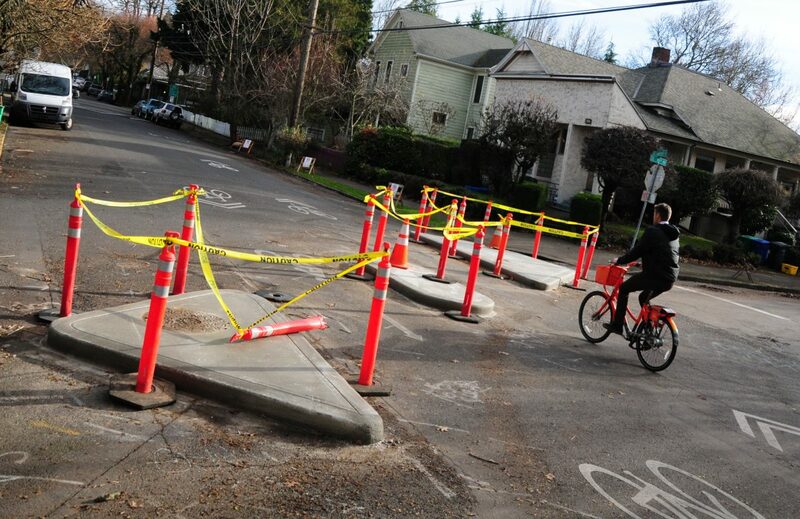 After hundreds of comments, dueling online petitions, and a now-legendary open house that devolved into a “mob scene” takeover, the City of Portland has emerged with a new approach to the Lincoln-Harrison Neighborhood Greenway Enhancement Project. They have altered their initial plans and — in an effort to assuage naysayers of certain elements of the old plan — have redoubled their efforts to effectively communicate the need for the project in general. 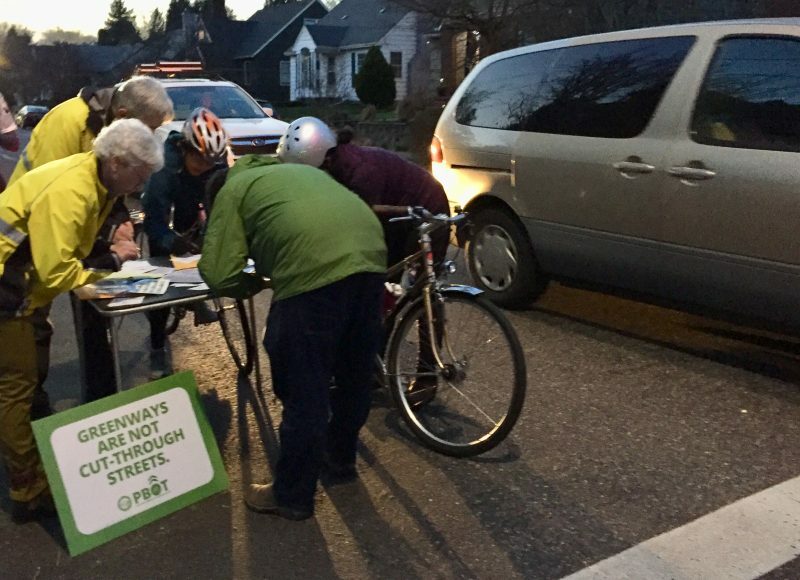 After what was described by readers as an “ugly scene” where some attendees acted with “strong hostility and aggression,” at an open house on Tuesday night, the Portland Bureau of Transportation said they now plan to extend the public process for their Lincoln-Harrison Neighborhood Greenway Enhancement Project. The main sticking of the project are plans for semi-diverters that would prohibit people in cars from turning onto Lincoln from 50th. Dozens of readers who attended the open house said it was taken over by neighborhood residents who are vehemently opposed to the diverters. In comments (that are still coming in) they recount a “mob” scene where people where being shouted down, intimidated, and ultimately silenced by anti-diverter advocates who allegedly took over the meeting. PBOT’s proposal for diverter at 50th. Remember earlier today when I told you tonight’s PBOT open house for the Lincoln-Harrison Neighborhood Greenway Enhancement project might get interesting? Well from what we’re hearing so far, interesting doesn’t even describe it. I wasn’t there, but several sources are reporting that it was completely bonkers. The crowd that’s vehemently opposed to a diverter at 50th and Lincoln was apparently very aggressive and nearly took over the meeting. 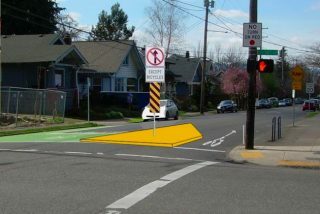 This is what PBOT wants to install on both sides of SE Lincoln at 50th. I’m sensing a disturbance in the Force. Various respected sources and a general feeling of uneasiness in my bones tells me that tonight’s open house for the City of Portland’s Lincoln-Harrison Neighborhood Greenway Enhancement project will be very consequential. In other words, there’s auto traffic diversion on the table — specifically a duo of semi-diverters on Lincoln on both sides of 50th — and a lot of very loud and very angry people are opposed to them. Yes, there are lots of people who support the diverters at 50th, but from what I’ve heard the nos have it. Pretty clear where the Tabor Rising neighborhood group stands on the issue. Remember that opposition to the City’s plans for traffic diversion as part of the Lincoln-Harrison Neighborhood Greenway project we we warned you about earlier this month? It hasn’t gone away. In fact, it appears to be getting stronger. At the Portland Bureau of Transportation’s open house for the project just one day after our post was published, we heard that people against the diverters “swamped” people who support them. “By a lot,” our source said. Then, at their monthly meeting last night, the Mt. Tabor Neighborhood Association (MTNA) voted 45-5 against one specific part of the Portland Bureau of Transportation’s proposal: a semi-diverter on both sides of Lincoln at SE 50th. 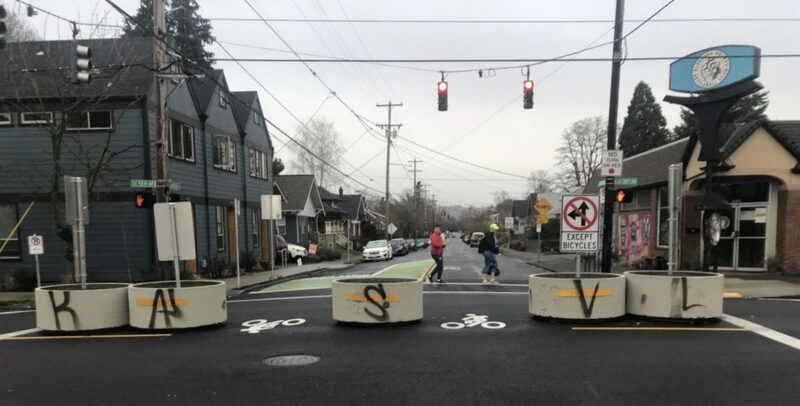 According to a BikePortland reader who was at the meeting, the vote was a motion to oppose the proposed diverter at 50th and Lincoln as currently designed and to request more information and a meeting with PBOT to ask questions and share concerns.